I was a stay at home mother when my children where young. I knit, (d'oh) I home sewed (clothing, curtains, cushion covers, quilts) I cooked. I rarely used commercial baby food—I had a hand mill and made my own. And I baked. I baked when I was a stay at home mother. I baked when I went back to work part time. I baked when I worked full time. My kids sometime longed for store made bread—but each time, they found it boring. Peer pressure wasn't enough to overcome the pleasure of a home made slice of bread. I still bake. But I'll admit, in recent years, I've baked less—baking for one means baking small quanities. And making the effort to kneed is the same for one loaf as it is for the 3 I used to bake each week. I just didn't make the effort for a single loaf. But now I have discovered slow rise bread. It breaks all the “rules” I knew. It uses cold water. Its not kneeded. It rises in the refrigerator, not in a warm place. I don't really follow the recipe (find one here, or here, or here) because, well I have confidence in my abiltity to make bread; and I don't want or need as much bread as the recipe makes. (I used a total of 2.5 cups of flour--(many of the recipes call for 4 or more cups). This week—sweet rolls. The dough doesn't have added sugar—I find the slow rise makes for a flavorful bread— not so much sweet as complex. I did add 1 scant teaspoon of maple sugar to the dough as mixed it--for a bit of sweet maple flavor--but not so much that the yeast feasted on the sugar and not the flour. I started with roll oats (½ cup) pulverized in the food processor till as fine as meal, in addition to the 2 cups of plain white flour. (Next week, or if not next week, next time, I plan to add some 8 grain cerial mix, some whole wheat flour, and make a health bread. Then I am going to try for an Anadama type corn bread... but I am getting ahead of myself) Oat are gluten free naturally, and make for a softer bread than one of all wheat flour. And they make a sweeter dough-naturally--the starch in oats converts more readily to maltose (malt sugur) adding an interesting complex sweet flavor, the lack of gluten makes the dough (and bread) more tender. Today, I rolled and stretched the dough out on a 9 x 14 inch board, brushed with melted butter, and then with a mixture of maple sugar, white sugar and cinnamon. I rolled it up, and cut into 9 inch slices 1 inch slices and let rise again—and now.. 9 lovely sweet rolls for me! Some will be breakfast rolls (with yogurt and fresh fruit) some will be come dessert—likely with a sweet fruit (baked apple or the like) to go along. All will be eaten up!--one right now, fresh and hot from the oven. 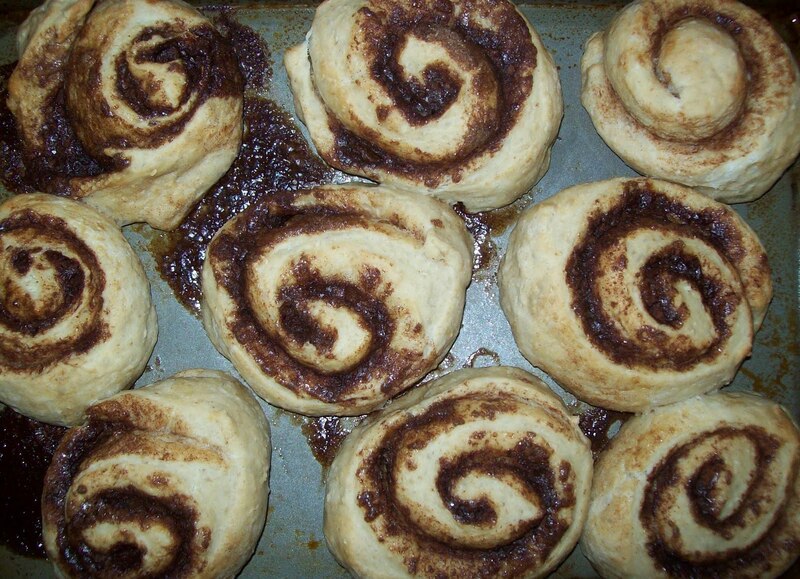 I don't think there is any better fragrance than that of cinnamon rolls baking in the oven. Yum! MMMMM! I love the no-knead, slow raise breads. They turn out good every time especially for us who have never mastered the kneading.